A set of prints depicting famous Western inventors and scholars which seem to have been produced by the Japanese Department of Education. 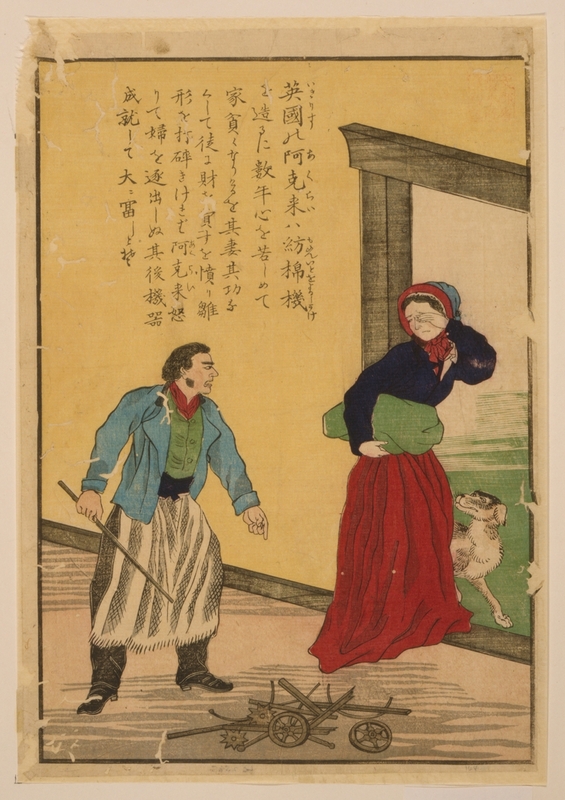 Although The Library of Congress only gives a rough date for them, between 1850 and 1900, the University of Tsukuba Library mentions a more specific 1873, a year which would make sense given the intense period of “westernisation” going on in Japan at this time, a presumed motive behind the making of the prints depicting such stalwarts of the industrial revolution in the West as James Watt and Richard Arkwright. 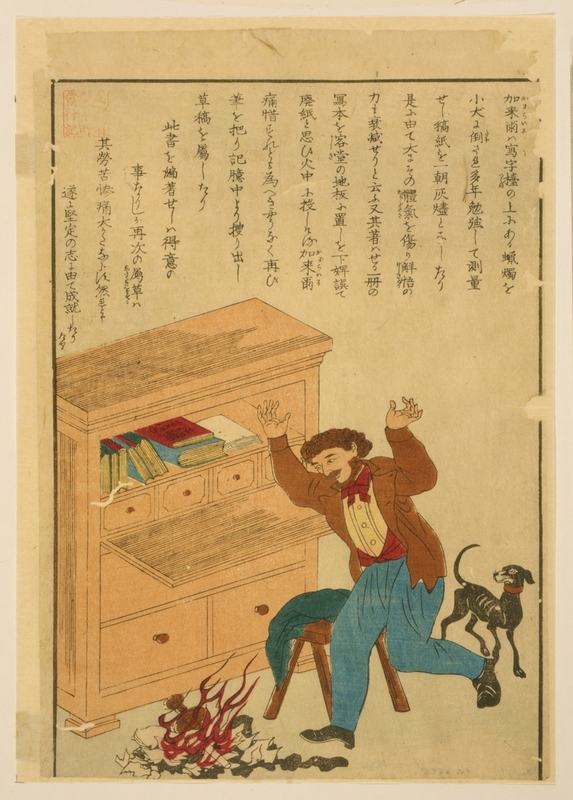 If the prints are indeed the result of such a motive, that is, to encourage young Japanese to take up the mantle of such Western luminaries, then the fact that many of the figures in the pictures seem to be somewhat under siege from various foe might seem at first to be a bit of a mystery. The great naturalist John James Audubon battles with a mischievous rat who has eaten his work; the dog of historian and poet Thomas Carlyle has upset a lamp burning his papers; the wife of Richard Arkwright, inventor of the spinning-frame, smashes his creation; the developer of the Watt steam engine James Watt suffers the wrath of his impatient Aunt; pottery impresario Bernard Palissy has to burn his family’s furniture to keep his kiln’s fire going. The only subject portrayed in any kind of half-way happy state is John Heathcoat who is pictured presenting his wife with the first successful results of his knitting machine. Although things appear to be going wrong for our Western celebrities, the text that accompanies each image paints a slightly more positive picture, revealing the moral, something akin to “If at first you don’t succeed then try again”, or “Perseverance prospers”. 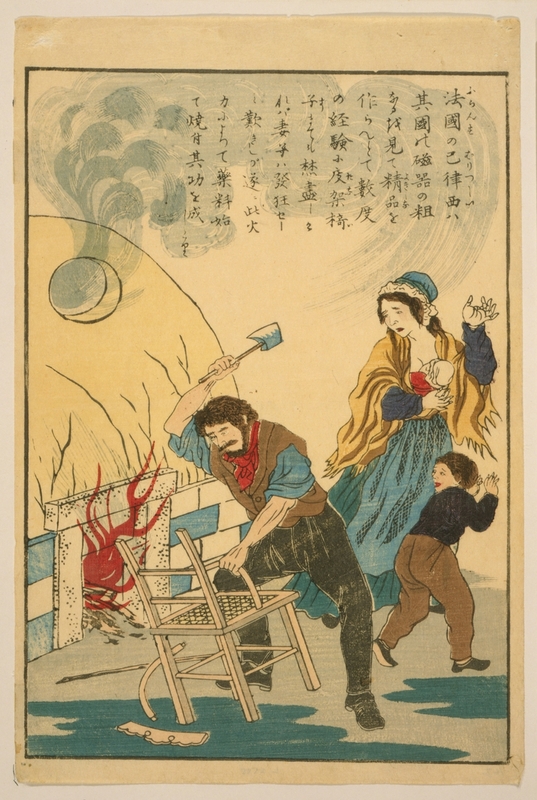 Perhaps, if seen in the context of Wakon-yōsai – “Japanese spirit and Western techniques”, as mentioned in Yoshikawa Tadayasu’s Questions and Themes on Progress (1867) – the illustrations might be hinting that the nation of Japan in particular has the qualities of patience, will-power, and tenacity to succeed in such fields. 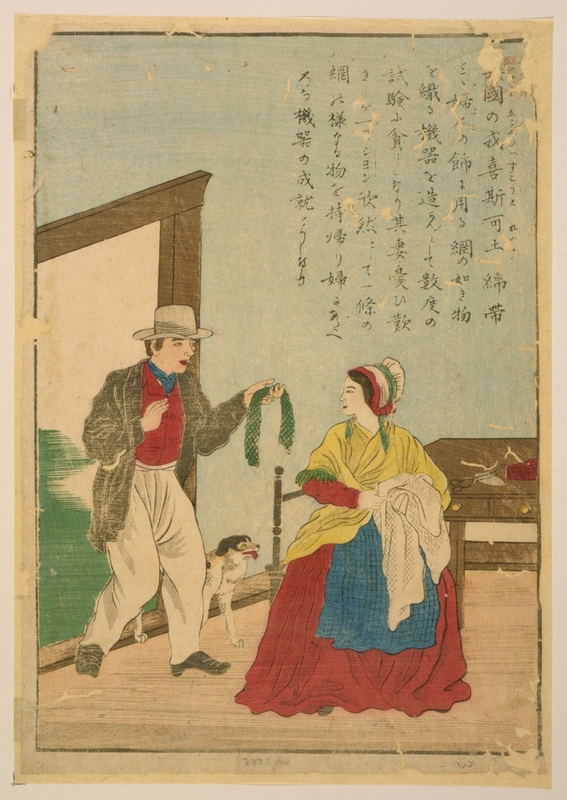 The information given by the University of Tsukuba Library suggests that there were eight more prints made in addition to the six we find in the Library of Congress collection, the other Western stars featured being Josiah Wedgwood, Titian, Josué Heilmann, Robert Peel, Benjamin Franklin, Jacques de Vaucanson, William Lee, and Joshua Reynolds. 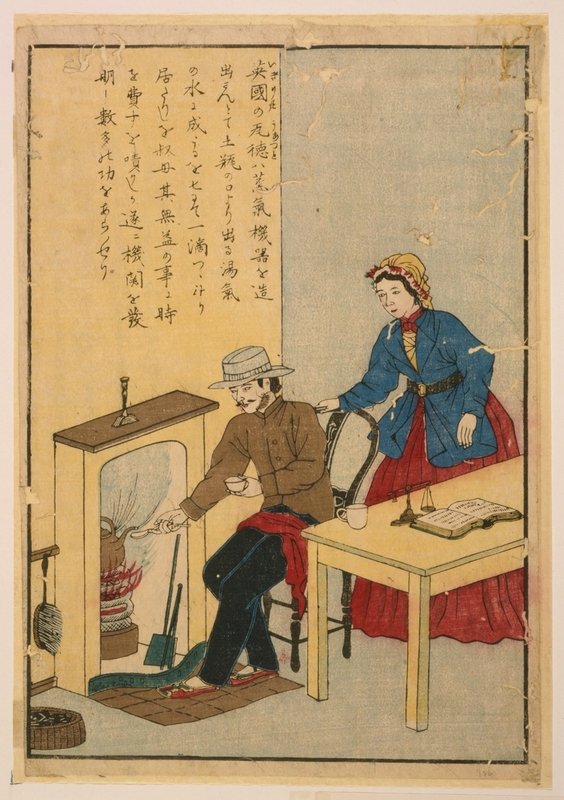 Many thanks to Ben Schlabs and Tomoko Tanaka for their help in shedding some light on the content of the Japanese text featured in each of the prints (the full Japanese transcriptions can be found on the University of Tskuba site here). We’ve included general summaries in English of the text (by no means word-for-word translations!) below each picture. The American celebrity Audubon’s important travel documents that he had been copying and gave to relatives for safekeeping were eaten by mice. 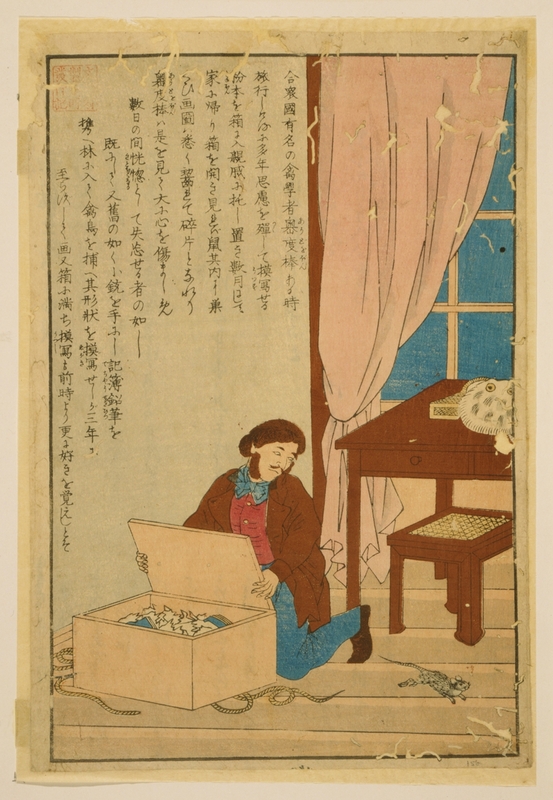 He was extremely sad but tried again, and after just three years, his boxes were once more full of paper. The Englishman Arkwright wanted to make a spinning-frame. It took him such a long time that he became very poor and so his wife got mad and broke his machine. Angry at her, he sent her away. But even after all this, he succeeded and became extremely rich. The Englishman Watt wanted to make a steam engine. He spent so much time on it that he upset his aunt. Finally, however, he was successful. The Frenchman Palissy wanted to make nice china. His wife and kids got very upset with him when he started throwing their furniture into the kiln(?) to feed it. But finally he succeeded. The Englishman Heathcoat wanted to make a lace-making machine. After trying so many times and failing he grew very poor. This made his wife very sad. Eventually, however, he succeeded and was able to give his wife lace.